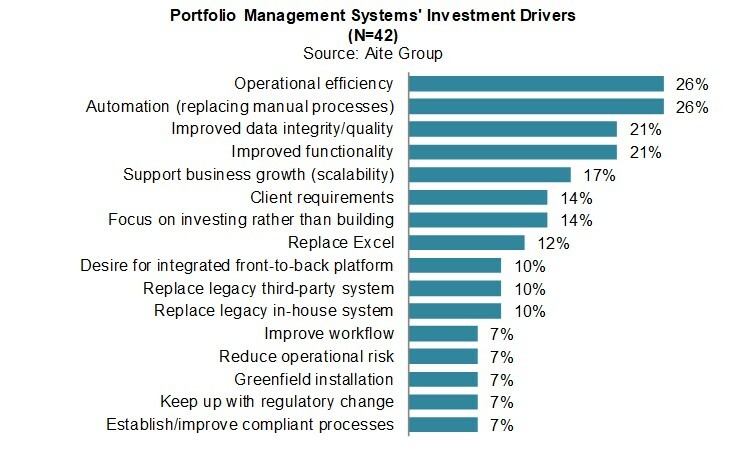 Portfolio Management Systems: The Next-Gen Tech Arms Race? Despite industry hype about next-gen technology for the buy-side, adoption remains painfully slow. London, 9 November 2017 – With increasing pressure on the buy-side community to find yield in a low interest rate environment, portfolio management and accounting systems are vital for firms’ smooth operations and help control costs while industry-wide inflows into passive investments compress fees. Moreover, buy-side organizations are increasingly relying on these systems to help meet the demands of regulatory change globally. But how much next-gen technology is being deployed within these systems, and what kind of functionality is the buy-side prioritizing? This report provides in-depth insights from the buy-side community on portfolio management systems. Based on Aite Group interviews conducted with 42 buy-side market participants between August 2017 and October 2017, it highlights current system implementation trends across buy-side segments and explores the demand for mobile functionality and artificial intelligence. This 51-page Impact Report contains 20 figures and two tables. Clients of Aite Group’s Institutional Securities & Investments service can download this report, the corresponding charts, and the Executive Impact Deck. This report mentions Amazon, Bloomberg, Brevan Howard, Equifax, FactSet, Google, Janus Henderson, J.P. Morgan, Man Group, Merrill Lynch, Microsoft, Sanlam, Schroders, Standard Life Aberdeen, and Tudor.